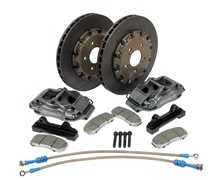 Brake Kit to suit Audi A4 (B5) 1995-2000. The Caliper body is made out of T2024 aluminum, machined from blank billets. The brake pads have proven to be high friction and low noise. The Rotor is made from premium grade FC28 carbon iron.